Step into the Clark's CafÃ© Fondue Royale for classic Swiss fondue or decadent fondue au chocolat hors d'oeuvres stations. Be transported by the tastes of Parisian street fare such as croque monsieur, choucroute, coquilles St. Jacques, and saucisson-en-croute. Sample the latest vintage Beaujolais and Sauvignon Blanc. Take the portrait theme to the extreme by posing for artist Michael Rousseau who will sketch fast and flattering portraits. Rousseau paints contemporary subjects in a very traditional manner, with a twist. Hop into the photo booth for a photographic keepsake. Pianist Joe Rose will play popular music selections from the turn of the century to the 1930s with an occasional light impressionistic piece from Debussy, Ravel, or Satie. Rose is the music director at St. Charles Church in Pittsfield, accompanist to the Berkshire Lyric choral organizations, and a recording artist. 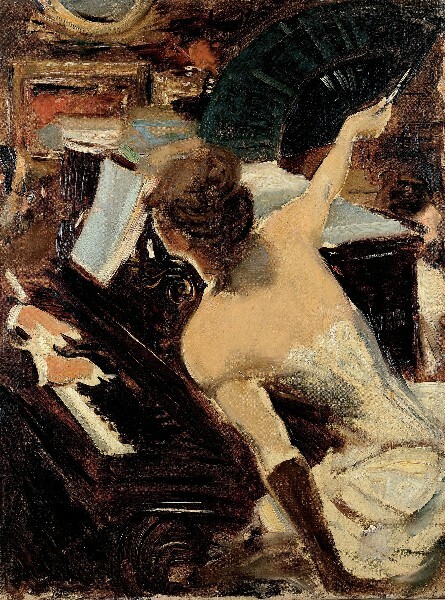 The evening includes a preview of Giovanni Boldini in Impressionist Paris. Through approximately seventy oil paintings and drawings, the exhibition presents an innovative look at Boldini's Paris-its places of entertainment and leisure, its inhabitants, and its environs-at a time when the Impressionists were investigating the same sites and subjects. This event is sponsored by WGBY Public Television for Western New England. The Clark is located at 225 South Street in Williamstown, Massachusetts. The galleries are open Tuesday through Sunday, 10 am to 5 pm (daily in July and August). Admission is free November through May. Admission is $15 June 1 through October 31. Admission is free for children 18 and younger, members, and students with valid ID. For more information, call 413-458-2303 or visit clarkart.edu. February 14 through April 25: The exhibition Giovanni Boldini in Impressionist Paris illuminates Boldini's early career while developing his unique style. Seventy works present an innovative look at Boldini's Paris-its places of leisure, its inhabitants, and its environs-at a time when the Impressionists were investigating the same subjects. The Clark, 225 South Street, Williamstown, MA. clarkart.edu, 413 458 2303.